We use plants to rapidly accumulate our products as the plants grow. In as few as three to four weeks after designing an antibody or immunoadhesin sequence, we can accumulate sufficient therapeutic protein in a readily scalable production and purification system for proof of concept and early preclinical testing. Our Quality Management System (QMS) ensures that the product and its custom purification process can be readily adapted to provide GMP quality protein for initial and follow-on clinical development. We have developed proprietary sequences and methods for expressing antibodies at unprecedentedly high levels in both transiently and stably transformed tobacco plants. We routinely achieve expression of IgG1 at levels between 0.5 and 3 grams/kg of plant biomass in our laboratory and greenhouses. These high levels of expression, along with our proprietary purification methods, result in high yield and purity of the final product. Many pathogens initiate disease by attaching to specific receptor proteins on the surface of cells in a human or animal host. Planet uses these receptors to provide potent defenses against disease. 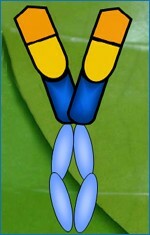 We fuse human receptors to the constant region of an antibody to create novel proteins called immunoadhesins. These immunoadhesins act as decoys, binding to a specific target virus or bacterial toxin before it can bind to human cells to initiate disease. We produce these immunoadhesin products rapidly, in large volume and high quality, using plants as the primary production platform.